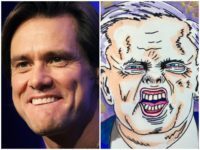 Actor Jim Carrey tweeted a drawing of Sen. Lindsey Graham Friday, writing that Graham’s “hideous and hateful face” is why women don’t report sexual assault. 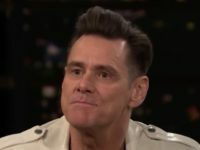 Venezuelans suffering through the worst crisis in the nation’s history have responded with outrage to actor Jim Carrey’s call to the world to “say yes to socialism.” In a column published Wednesday, columnist Laureano Márquez argued that Carrey misunderstands the “repression” conducted in the name of socialism in places like the Latin American country. 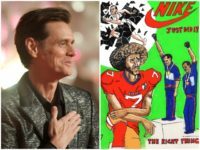 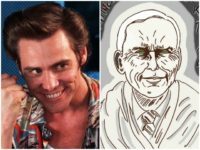 Actor Jim Carrey took to Twitter with another of his primitive art drawings this time to celebrate Nike’s latest “Just Do It” ad featuring Colin Kaepernick. 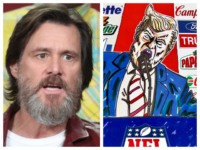 Actor Jim Carrey accused President Trump of “inciting civil unrest” on Twitter Sunday, despite his own history of depicting Trump being the target of violence. 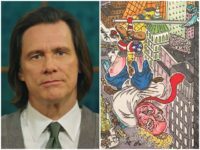 Actor Jim Carrey posted artwork depicting President Donald Trump burning at the stake on Wednesday, the latest in his collection of violent fantasies against Republicans and members of the Trump administration. 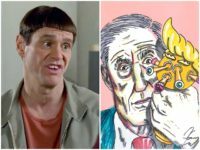 Troubled actor Jim Carrey has taken up his art tools again, this time to thrill to recent convictions of Trump associates and to post a drawing of President Donald Trump hanged with a U.S. flag. 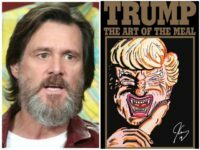 One time comedy star Jim Carrey has indulged tweet after disturbing tweet filled with often blood-soaked “art” attacking President Trump. 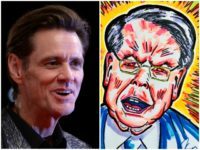 Actor Jim Carrey has once again tweeted out one of his politically charged primitive paintings, this time killing off all of Congress. 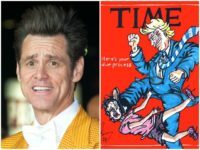 The Dumb and Dumber star Jim Carrey used the immigration-tinged Time cover for his latest animated attack on President Donald Trump. 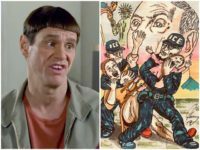 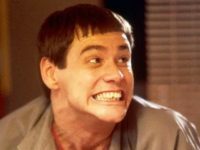 Actor Jim Carrey of “Dumb and Dumber” fame has attacked President Trump’s Christianity, suggesting that Trump would have considered Jesus a “loser” while depicting him as a Roman soldier crucifying Christ. 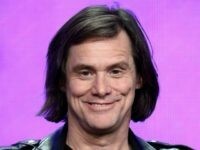 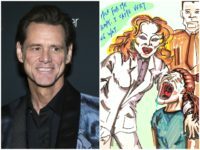 Actor and activist Jim Carrey tweeted a picture in which he accused First Lady Melania Trump of not giving “two craps” about the “misery” of children at the border. 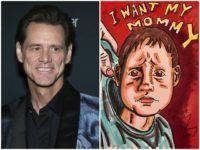 Actor Jim Carrey tweeted his latest piece of politically charged paintings on Tuesday, this time of President Donald Trump preparing to eat an immigrant child. 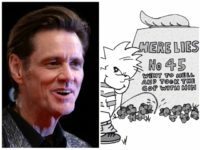 Actor Jim Carrey tweeted a picture on Thursday of Calvin, from the hit comic strip Calvin & Hobbes, urinating on President Donald Trump’s grave. 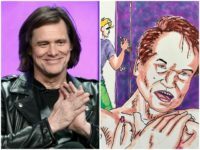 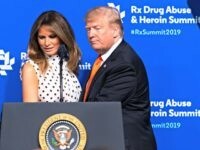 Actor Jim Carrey shared his latest politically charged artwork on Sunday, this time mocking First Lady Melania Trump as a mindless captive as she continues to recover from a recent operation. 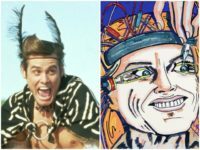 Last year, Jim Carrey’s The Bad Batch, managed to gross just $181,000 in theaters — and that is the good news. 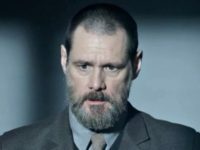 Carrey’s latest movie, the $4.5 million thriller Dark Crimes, just went directly to home video. 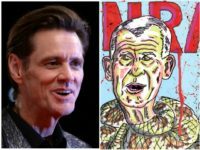 Actor Jim Carrey is taking aim at NRA “scoundrels and sadists,” referring to the gun rights group as “a national disgrace.” Carrey tweeted a drawing that depicted newly chosen NRA President Oliver North as a snake. 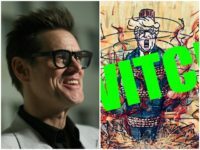 Actor Jim Carrey shared his latest politically motivated piece of artwork on Friday, this time the Hollywood star’s portrait taking aim at Vice President Mike Pence. 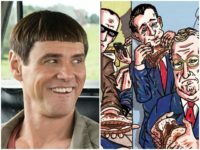 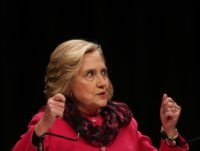 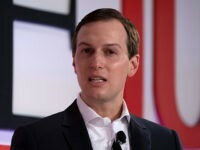 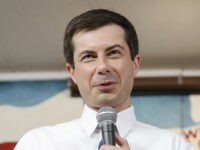 Actor Jim Carrey isn’t pledging full-fledged fealty to the Democrat Party with his latest primitive painting showing the carcass of a rotting donkey. 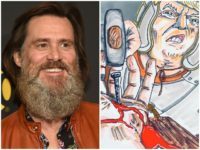 Actor-turned internet troll Jim Carrey shared a drawing of Jesus Christ’s crucifixion on Good Friday, the latest in his ultra-provocative collection of artwork.